Nest completed and first egg laid April 27th. Last egg laid May 3rd. Young began to fly May 27th. Young left the nest June 1st. Total time occupied 47 days. Such is the usual time required for bringing forth a brood of this species of Wren, which is the best known of the family. In the Atlantic states it is more numerous than in the far west, where wooded localities are its chosen haunts, and where it is equally at home in the cottonwoods of the river valleys, and on the aspens just below the timber line on lofty mountains. 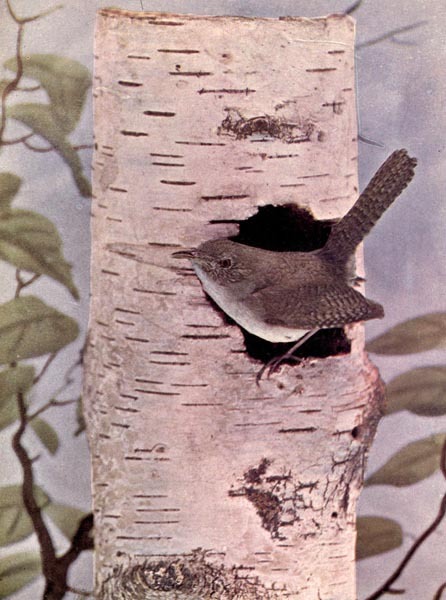 Mrs. Osgood Wright says very quaintly that the House Wren is a bird who has allowed the word male to be obliterated from its social constitution at least: that we always speak of Jenny Wren: always refer to the Wren as sheas we do of a ship. That it is Johnny Wren who sings and disports himself generally, but it is Jenny, who, by dint of much scolding and fussing, keeps herself well to the front. She chooses the building-site and settles all the little domestic details. If Johnny does not like her choice, he may go away and stay away; she will remain where she has taken up her abode and make a second matrimonial venture. 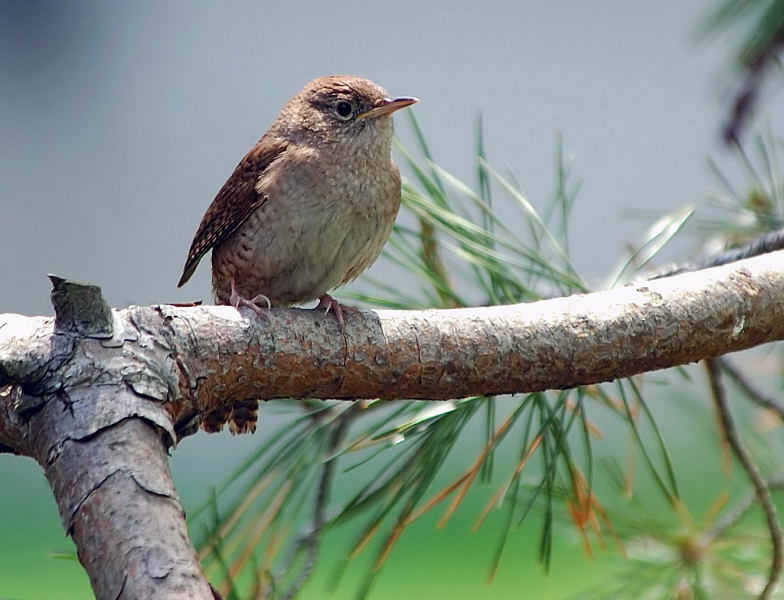 The House Wren’s song is a merry one, sudden, abruptly ended, and frequently repeated. It is heard from the middle of April to October, and upon the bird’s arrival it at once sets about preparing its nest, a loose heap of sticks with a soft lining, in holes, boxes, and the like. From six to ten tiny, cream-colored eggs are laid, so thickly spotted with brown that the whole egg is tinged. The House Wren is not only one of our most interesting and familiar neighbors, but it is useful as an exterminator of insects, upon which it feeds. Frequently it seizes small butterflies when on the wing. We have in mind a sick child whose convalescence was hastened and cheered by the near-by presence of the merry House Wren, which sings its sweet little trilling song, hour after hour, hardly stopping long enough to find food for its meals. Range—Eastern United States and southern Canada, west to the Mississippi Valley; winters in southern portions. Nest—Miscellaneous rubbish, sticks, grasses, hay, and the like. Eggs—Usually seven; white, dotted with reddish brown. What a neat little bird. I was thrilled to get to see one up close just this last Saturday. We don’t see them often, at least I don’t. 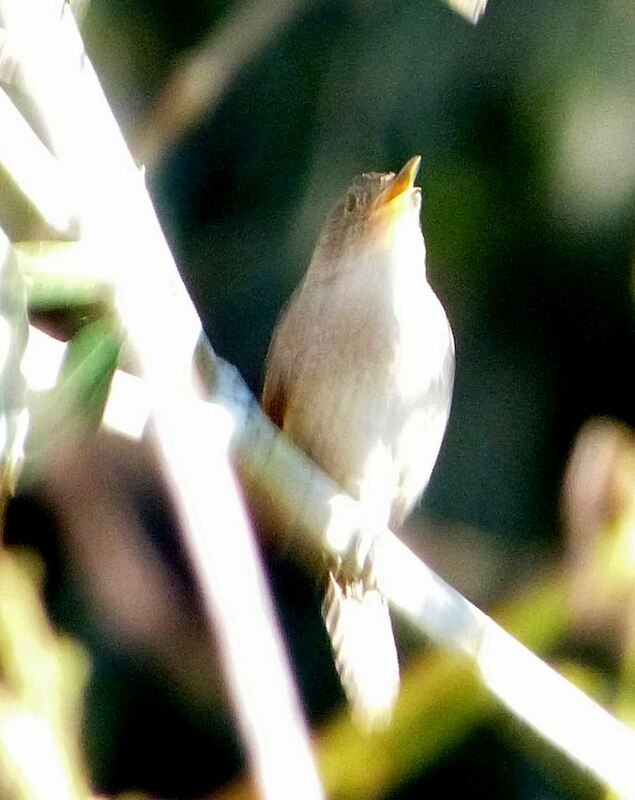 We were birdwatching out at Circle B Bar Reserve and the Wren just sat there and sang while three of us tried to get its picture. My photos are not so good, but at least they are a “proof shot.” I have heard and seen the Carolina Wren out there occasionally, but not the House. Wrens belong to the Wrens – Troglodytidae Family which has 83 species at present. “The wrens are mostly small, brownish passerine birds in the mainly New World family Troglodytidae. Only the Eurasian Wren occurs in the Old World, where in Anglophone regions it is commonly known simply as the “wren” as it is the originator of the name. 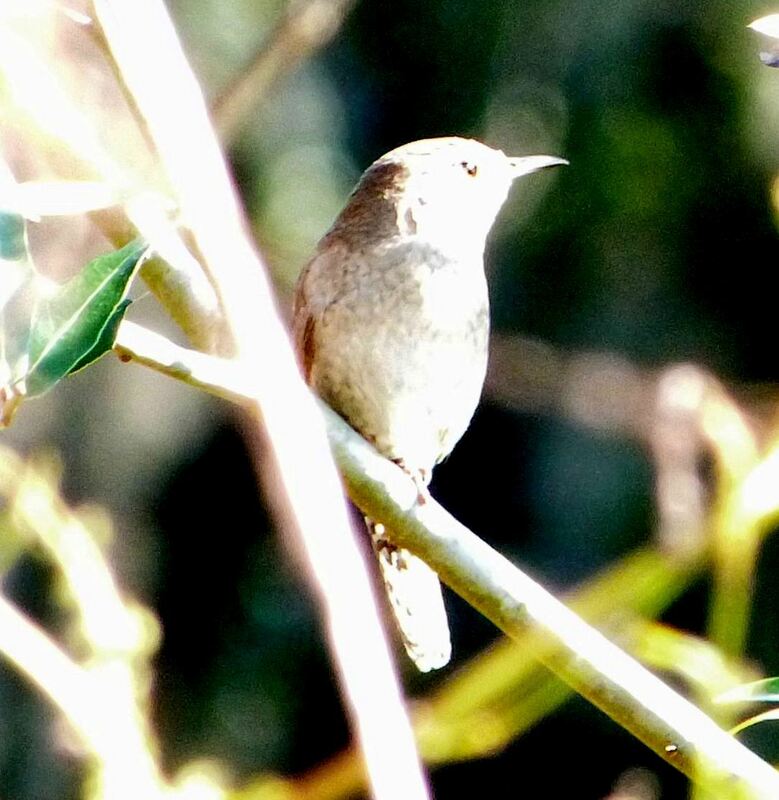 The name wren has been applied to other unrelated birds, particularly the New Zealand wrens (Acanthisittidae) and the Australian wrens (Maluridae). Most wrens are small and rather inconspicuous, except for their loud and often complex songs. Notable exceptions are the relatively large members of the genus Campylorhynchus, which can be quite bold in their behavior. Wrens have short wings that are barred in most species, and they often hold their tails upright. As far as known, wrens are primarily insectivorous, eating insects, spiders and other small arthropods, but many species also eat vegetable matter and some will take small frogs/lizards. The House Wren, (Troglodytes aedon), is a very small songbird of the wren family, Troglodytidae. It occurs from Canada to southernmost South America, and is thus the most widely distributed bird in the Americas. It occurs in most suburban areas in its range and it is the single most common wren. Its taxonomy is highly complex and some subspecies groups are often considered separate species. Adults are 4.3 to 5.1 in (11 to 13 cm) long, with a 5.9 in (15 cm) wingspan and weigh about 0.35 to 0.42 oz (10 to 12 g ). Among standard measurements, the wing chord is 1.9 to 2.1 in (4.7 to 5.3 cm), the tail is 1.5 to 1.7 in (3.9 to 4.4 cm), The subspecies vary greatly, with upper parts ranging from dull greyish-brown to rich rufescent-brown, and the underparts ranging from brown, over buff and pale grey, to pure white. All subspecies have blackish barring to the wings and tail, and some also to the flanks. All subspecies show a faint eye-ring and eyebrow and have a long, thin bill with a blackish upper mandible, and a black-tipped yellowish or pale grey lower mandible. The legs are pinkish or grey. The short tail is typically held cocked. This entry was posted in Birds, Birdwatching, Christian, From The Past and tagged Birds Illustrated by Color Photography, Home School, Kids, Photography, Troglodytidae, Vol 2 #3 Sept 1897, Wren, Youth. Bookmark the permalink.